Throughout this tutorial, I hope you learn how to arrange the dishes in a bento box. The Nori Punch I used in this tutorial came with this Sanrio Characters Bento Book. My favorite dish that my mom cooks!!! 1. Remove tough base of Shimeji mushrooms and break into pieces. Slice the peppers. 2. Heat sesame oil in a frying pan and saute the Shimeji mushrooms and the peppers. 3. Cook until softened and season with Shio-Kombu. 1. Slice fish sausage and cut into a strawberry shape with a design knife. 2. Cut and make zigzag Edamame halves for the strawberry hulls. 4. Arrange some black sesame seeds for strawberry seeds with tweezers. 1. Beat an egg in a bowl and season with Yamaki Kappo Shirodashi (a bit of salt and sugar is fine). 2. Heat cooking oil in a tamagoyaki nabe (rectangular omelet pan) on low heat, pour the egg mixture in the pan and spread over the surface. 3. Cook the egg until the edges begin to dry, then flip it over and cook the other side for about 10 seconds. Leave it to cool completely. 4. Cut the egg lengthwise, fold in half lengthwise, and make vertical slices on the folded side. 5. Roll up the egg and attach it with a bit of spaghetti pasta. 1. With a permanent marker (Sharpie), trace your favorite My Melody illustration on the parchment paper and cut it out. 2. 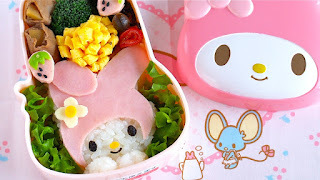 Pile up some steamed rice, cover with plastic wrap, place the My Melody stencil, and shape it with your fingers. Pinch and create chiseled jaw, because you want to draw a clear outline where you don't put the ham on top. 3. Place the My Melody stencil on a slice of ham and wrap with plastic wrap. Cut out the hood and the folded ear with eyebrow scissors. 5. Cut out and place the My Melody's flower hair accessory stencil on a slice of cheese. Use a design knife or a toothpick to cut carefully around the stencil. Cut out a slice of cheddar cheese to make a core of the flower and a nose. 6. Place the side dishes and the rice in a bento box. Then arrange the parts with tweezers.